Birds have developed many strategies for protecting their young. But only one species can tuck its chicks into pouches under its wings, then fly the young to safety. It’s the Sungrebe of Central and South America. Despite the name, they are not closely related to grebes. Sungrebes swim and dive on quiet freshwater streams. Both sexes incubate the eggs in a nest on branches just above the water. But when the young hatch, naked and helpless, the male takes them under his wing. He’ll swim — and fly if he needs to — with chicks on board until they’re able to swim. Sungrebes are duck-sized water birds with pointed bills. Despite the name, they are not closely related to grebes. Shy and difficult to observe, Sungrebes swim and dive on quiet freshwater streams. 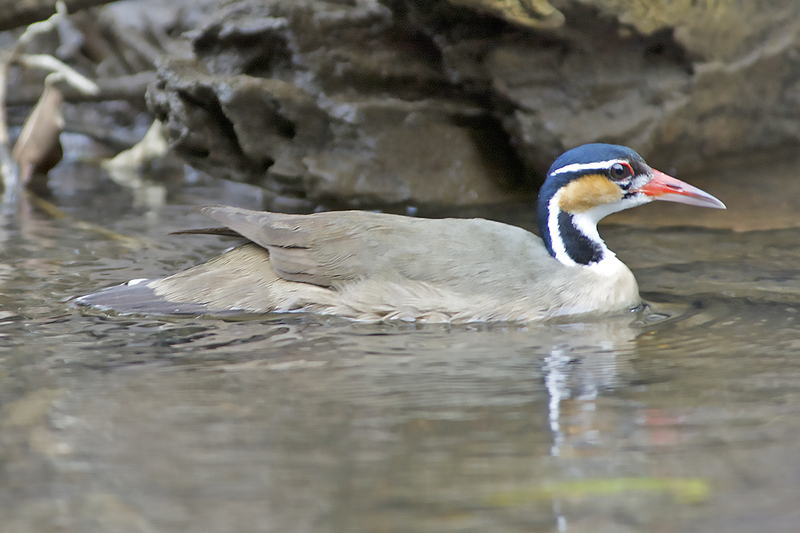 Both sexes incubate the eggs in a nest on branches just above the water. But when the young hatch, naked and helpless, the male takes them under his wing. Literally. Because only the male has those little skin pouches I mentioned. He'll swim — and fly if he needs to — with chicks on board until they're able to swim for themselves. The tropical water birds called jacanas also may carry chicks under their wings. [Northern Jacana call, http://macaulaylibrary.org/audio/2913, 1.07-1.11] But, lacking pouches, they pin the chicks against their bodies with their wings and trot off across the lily pads, the chicks’ legs dangling below. Only the male Sungrebe has evolved chick-carrying bags under its wings.